Microsoft CEO Steve Ballmer has painted the company's Bing search engine meeting that Bing represents the last stand of the Spartans against the marauding Persian Empire. The outgoing boss told attendees at a financial analysts meeting this week that Bing's rearguard action is the only thing preventing a complete Google monopoly of the search market. Pondering what Microsoft needs to do to generate more income from search and advertising, Ballmer pointed to Google's example. He said: "Google does it. They have this incredible, amazing, dare I say monopoly that we are the only person left on the planet trying to compete with." However, as much as Big Steve wants to bring home the bacon, he won't be mirroring Google's approach, which he claims is worthy of discussion with competition regulators. He added: "I do believe that Google's practices are worthy of discussion with competition authority, and we have certainly discussed them with competition authorities,"
"I don't think their practices are getting less meritorious of discussion." Recent figures have shown Bing is gaining ground somewhat. It now boasts 17.9 per cent of the market, while Google continues to comfortably lead the way with 67 a per cent share. 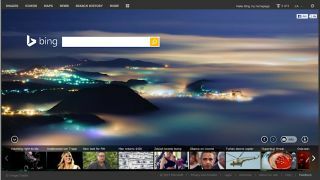 Have you seen Bing's new paint job?